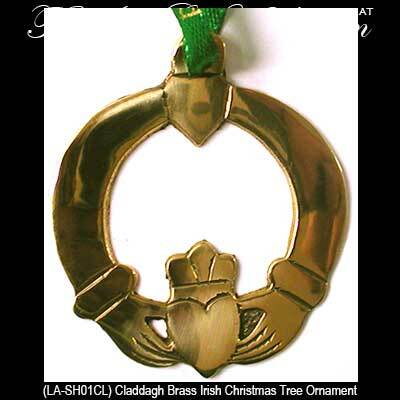 Claddagh Irish Christmas Tree Ornament Made of Solid Brass. Double Sided, Diamentional Design, 2 1/4" Wide x 2 1/2" Tall. Ready to Hang with the Included Green Ribbon. Gift Boxed with the Claddagh Legend. Made in Ireland by Liffey Artifacts.